The potential applications of Real Wireless Power -- over air, no charging mats or fancy algorithms required, while in motion -- don’t end with smartphones and personal devices. Intelligent buildings, like retail, will be one of the first markets to embrace and benefit from Real Wireless Power like Cota®. Considering energy efficiency and environmental design is one aspect of creating a fully intelligent building project, and it’s a big, important one for many. The US Green Building Council notes that “LEED began as a way for new construction (NC) projects to embrace energy efficiency and environmental best practices” and since 2000, the number of registered LEED projects has continued to grow. Real Wireless Power has the ability to decrease LEED building operational costs by increasing energy efficiency of small devices. In additional to sustainability, intelligent building service providers, manufacturers, contractors, and brands are also often striving to create and/or integrate features that make a building “smart.” Think facilities management, data collection, and systems automations that make workers more efficient and the environment safer and more convenient. How do these companies find the extra power and still remain energy efficient? You guessed it: Real Wireless Power. Before we get into all the benefits, let’s first address the issue everyone is concerned about with regard to implementing IoT large-scale: security. 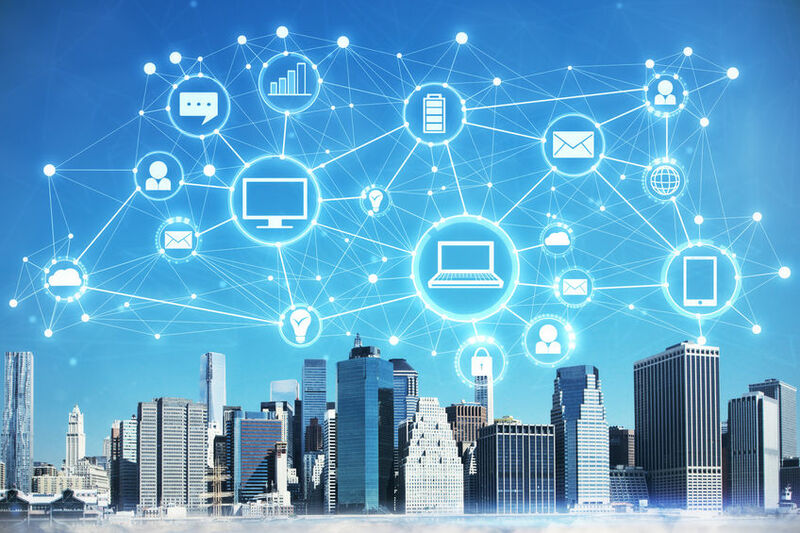 Interconnectivity is fundamental to a well-functioning IoT system, and when there’s interconnectivity and communication among devices and people, there’s the potential for security breaches. Real Wireless Power offers a two-way communication path along with the delivery of power, a path that should be securely managed through cloud software. So even if you have hundreds or thousands of devices communicating throughout a building, all access to this data and functionality should be absolutely controlled by you. Why Adopt Wireless Power Now? “Revenue related to installations of sensor-equipped lighting, climate control equipment, thermostats and other automation systems could quadruple [from 2016-2026] to about $732 billion,” reports Navigant Research. The rate of growth in the smart buildings industry is not sustainable without Real Wireless Power. Wireless power is the common denominator that makes that growth continue. It enables faster installations, user convenience, maintenance facilitation, safer environments, and a smaller environmental footprint, to name a few. Wireless power receivers will soon be integrated to all small devices and products and wireless power transmitters will be built right into the building construction as a differentiator, a value-add, and potentially a monthly operational cost for companies in the intelligent building industry. Other companies like Tesla, UTC Building & Industrial Systems, Schneider Electric, and ABB are also planning and developing advanced infrastructures systems for intelligent buildings. This list is by no means comprehensive, but it gives you an idea of the scale of effort and commitment behind future-thinking initiatives that will benefit from wireless power. Eliminate the need for buying and managing disposable batteries. Power thousands of inaccessible or hard-to-reach sensors. Deliver power to every inch of a room or building by linking transmitters. Prioritize which devices get power (or default to lowest battery levels), view the basic power usage of the device, and set up and manage users. Put an end to wasted energy; Cota goes into sleep mode when not needed. In contrast, every device and charger that’s plugged in continues to receive some level of power, even when not in use.